You are in : Home » People » Proud to be Peg » Finger painting, what fun! Little ones really love finger paints!! There is an age when there is a very fine line between drawing and making a mess. Especially when finger paints are involved. Especially if edible colors are involved. Especially if the chosen site for giving young artists free rein to practice is their high chair. The pages of the BeAFunMom blog offer lots of great ideas to have fun together with your children, including lots of little easy-to-organize activities that are guaranteed to be fun! There are lots of ideas there and one of them is how to make finger paints with yogurt. Colors and taste – enough to make you lick your lips!!! What do you think? Does this child look satisfied? 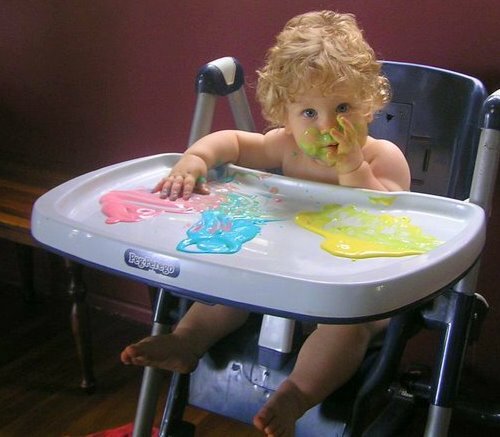 He looks really enthusiastic to us and, let’s say it, his mother made the right choice when she bought that high chair – she’ll have it clean in no time. A special thank you to Kelly, who published this photo, and some advice: her blog is really full of great tips!